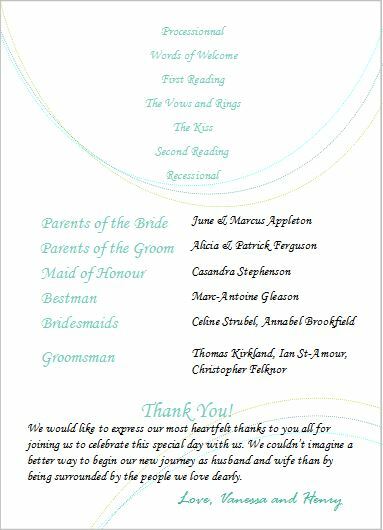 The following wedding program examples are simple and concisely presented to make it easy to follow for your guests. Art Deco, Boho-chic, Seaside, Floral, Lace are only some of the designs presented in this article. These should help you determine the type of layout you want for your wedding program. Also, I’m giving you a step by step simple wedding program fan project with a free downloadable template file. 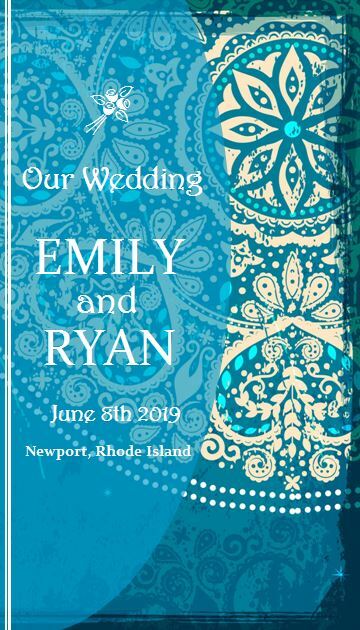 This wedding program template is completely customizable with your own picture. 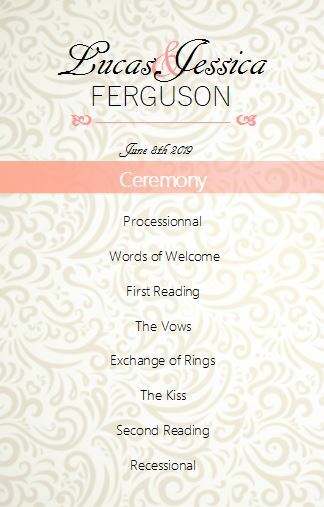 I’ve also provided an order of events wording example that you can personalize to fit your needs. But first, let’s have a look at a few guidelines to help you pick the best program format. There are many ways to make a wedding program. However, some designs are better when there is a lot of information to fit in. For example, a booklet design is the most versatile format as you can add more pages if needed. 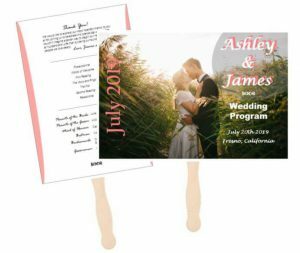 On the other hand, smaller and brief wedding programs can be made into fans using half a page, thus cutting the cost of material and printing. Important: Keep in mind that the backgrounds and patterns or images found in this article are the work of graphic designers who own the copyrights. On the other hand, these provide inspiring wedding program ideas you can use as a starting point to design your own. The wording and graphic details I added will help you envision how the final product can look like. Let’s have a look at these wedding program examples. 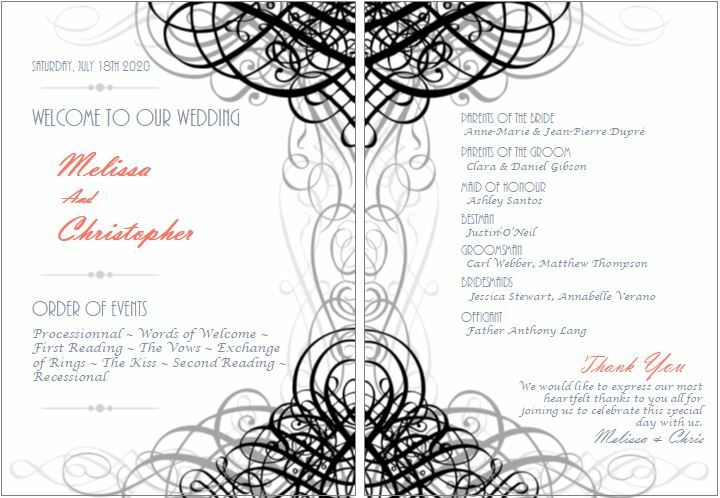 The following wedding program examples show a brief and straight to the point wording structure. This white and gold an wedding program model includes a high-level order of events on the front side and typical detailed ceremony activities on the back side. The main advantage is to provide your guests with an actual time-frame. It’s a great option when the wedding event lasts throughout the day and evening and is not held all at the same location. 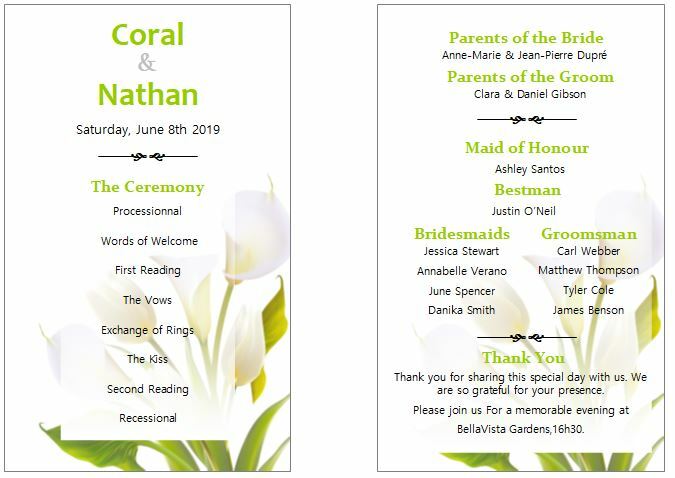 A simple and elegant design which includes the ceremony detailed events, parents presentation, and a thank you message. The colors are light and put the focus on the information. 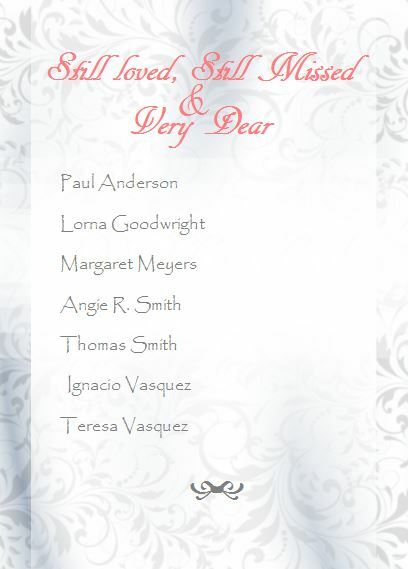 This damask design wedding program has the same structure as the previous. However, the look of it is soberer but still dynamic as it uses contrasting colors. The following design is beautifully adorned with cascading black and gray ribbons. Using such a design requires a lot of space. Still, all the information is there! This is possible by combining all ceremony activities in one paragraph instead of presenting each of them on a single line. Same goes for the groomsmen and bridesmaid’s names. 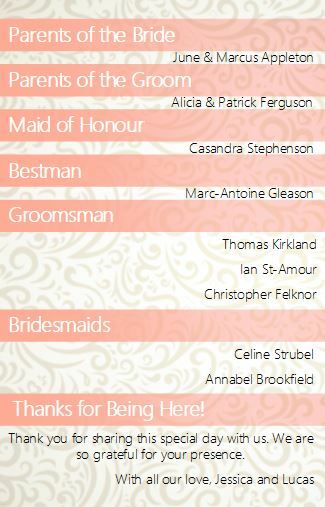 A lovely, springtime wedding program design which focuses on the order of events and with an emphasis on the titles. 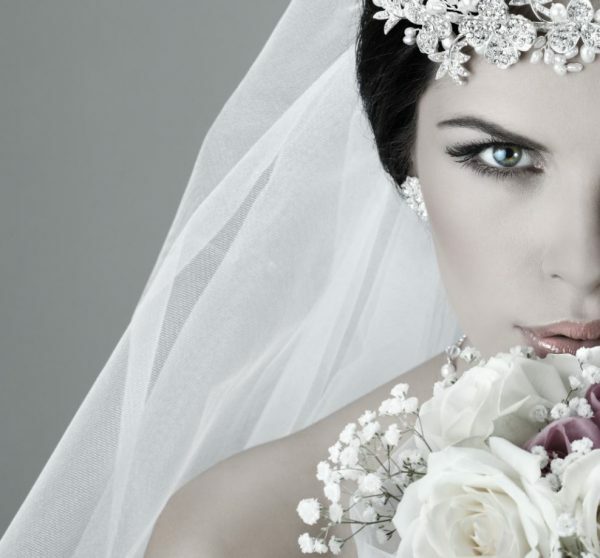 This creates a clear, easy to read and practical wedding program structure. 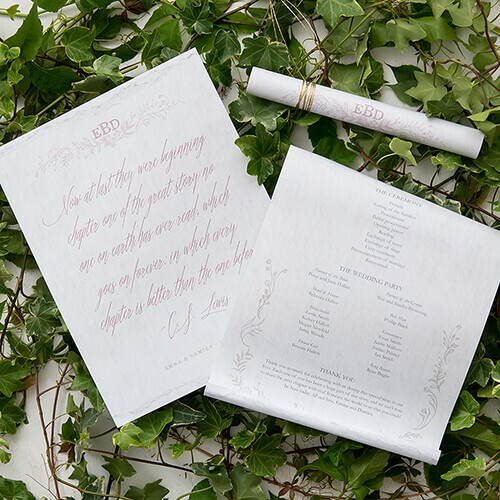 This leaflet wedding program is perfect to make it easy for your guests to read. This format is also a great option if you have a lot of information to fit in. The example below can be used with larger paper formats since you can fold it several times. 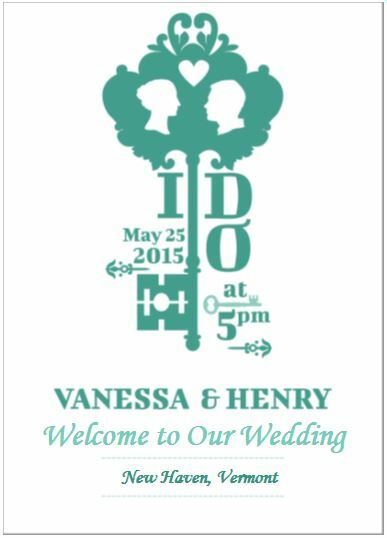 It’s a good way to make a cute version of a wedding program that would otherwise look like a giant poster. 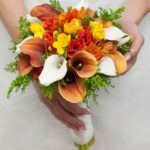 The boho-chic style wedding is a popular theme that particularly fits well with beach wedding themes. 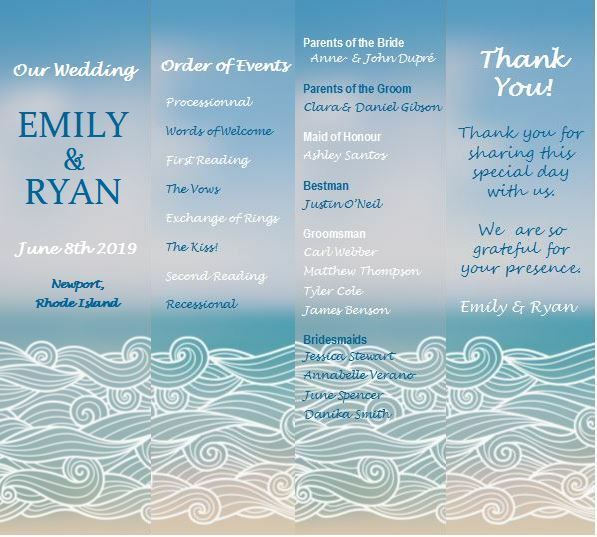 In the following wedding program example, the blue, turquoise and sand mandala background looks both refined and ethereal. It really set the tone for a beach bohemian style wedding. This Alice in Wonderland inspired design is minimalist and allows plenty of room for your specific wording. In fact, you can easily group the order of events into one paragraph to add another text section or a picture. 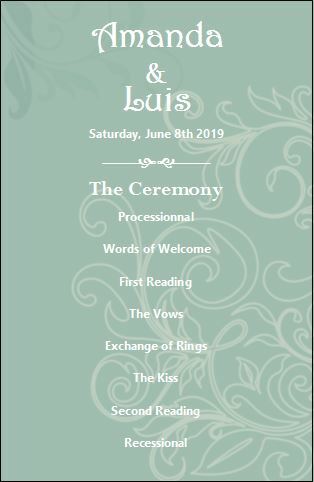 The following wedding program examples feature remembrance messages ideas with a unique structure. 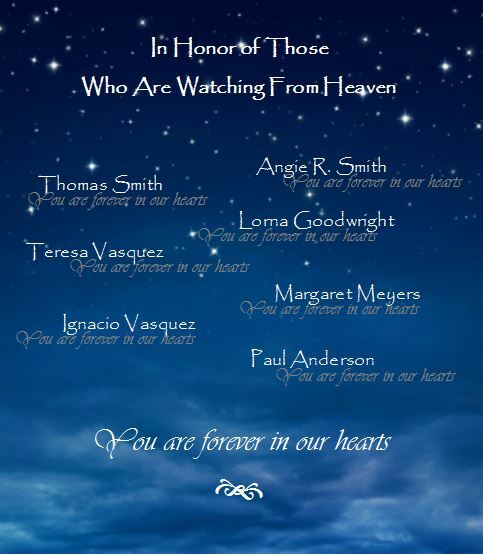 These can be added to any wedding program without having to match the design and color schemes due to the tribute nature of it. 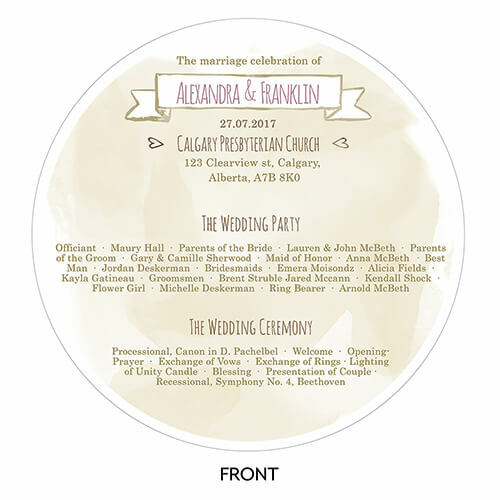 By the way, these are intended to be wedding program fans but you can also use them as is by not adding a fan handle. It just makes it even more simple to make! There are many ways to make a wedding program fan that represents you. The following free design is meant to be customized with a picture. You can choose a picture that represents you best. 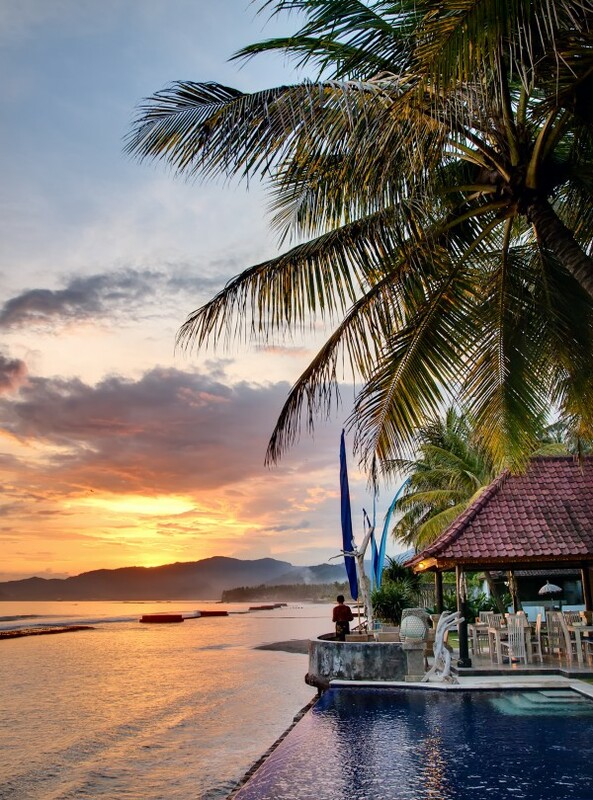 If you love traveling, add a picture of you on your last vacation. If you have kids, a family picture will look great. It can also be anything related to weddings like wedding bands image, a picture of the church or venue where you’ll be having your ceremony, a wedding bouquet picture, etc. Important: the pictures in this project are the work of independent photographers and graphic designers. These are only used to show you how it can look with your personal picture. They are not part of the downloadable template. When it comes to doing it yourself, it’s pretty much a question of patience and using the right materials. This especially true for a project you’ve never done before. Corner rounder tool: useful if you want to make clean and even rounded edges on your wedding program fan. Add a personal picture and modify the names and other information. I suggest you start by inserting your picture to see if the format fits correctly. Don’t hesitate to test with different pictures to see which looks better. You can resize the picture to your liking. Then change the wording to your own information and save your project. When you’re done, print both the front and the back of what will become your wedding program fan. 1- You now should have to sheets of paper showing the back and front of your program. You can now cut both sides of the program. Make sure to cut on the interior side of the dotted line to prevent it from showing on the final product. 2- It’s now time to glue everything together. First, delimit the surface you want to glue on the wood handle. Tip: You can take a measure of the exact length on which you’ll apply the glue and reuse. Mark it with a pen on the wood stick. If you are satisfied with the result, you will be able to reuse this measurement for the other wedding program fans you’ll be making. This way you’ll avoid having handles that are too short to hold or too long. Tip: To avoid spending 5 minutes holding your soon-to-be wedding program masterpiece, use clothespins to hold everything together straight and leave it to dry all by itself! Once your handle is solidly attached to the first piece of paper, apply glue to the back of the second piece and let dry. Personally, I like to apply glue in a continuous thin line close to the edges of the sheet to make sure that there are no gaps or lose corners. Tip: If you’re unsure how much glue is required, test it on scrap paper pieces to see how much glue is needed. This will prevent having excess glue coming out from the edges or paper wrinkling. Once your first wedding paper fan is completely dry, smooth the edges with scissors if needed. Don’t choose a standard double, or worst, a single-sided program for the wrong reasons. I see many people making this mistake. A regular program (one that is not intended to be used as a fan) is usually sized according to the information you want to put in it, not the other way. If you try to fit the same amount of text you have in a regular page format (8 1/2 x 11 in.) in a fan type of program you inevitably have to make some compromises. You’ll soon realize that the program is packed with a lot of information written in a tiny font size. This makes it confusing and hard to read for your guests. Instead, choose a card format or multiple petals fan to allow enough space and make it enjoyable to read. Freestyle brings the term “custom” to another level. It can be a heart shape, leaf shape, mason jar shape, etc. In other words, it can be customized to anything you can imagine! This one is popular because of its simplicity. Choose a different shape than the regular rectangle to add a personalize it. The writing space is limited, though. Avoid the visual clutter by not overloading the program with text. This program format should only be used if your program is sticking to the basics. Made with 2 or more blades or petals. This shape is interesting if you want to fit a lot of information on it and make information easy to find and read. In fact, each petal can contain a specific information instead of having all of it on one page as in the standard program. 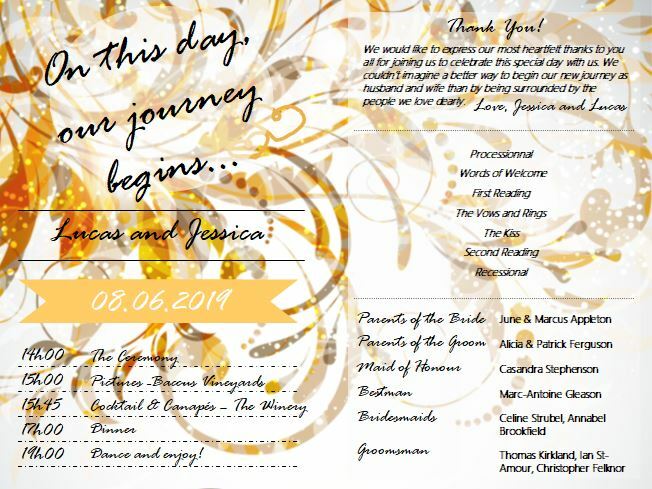 I hope you found some inspiration in the wedding program examples gathered here. If you have any questions or comments please leave them in the section below.